Safe and reliable photo recovery software to help you recover lost photos, pictures, images files and videos from your camera/camcorder fast and easy. 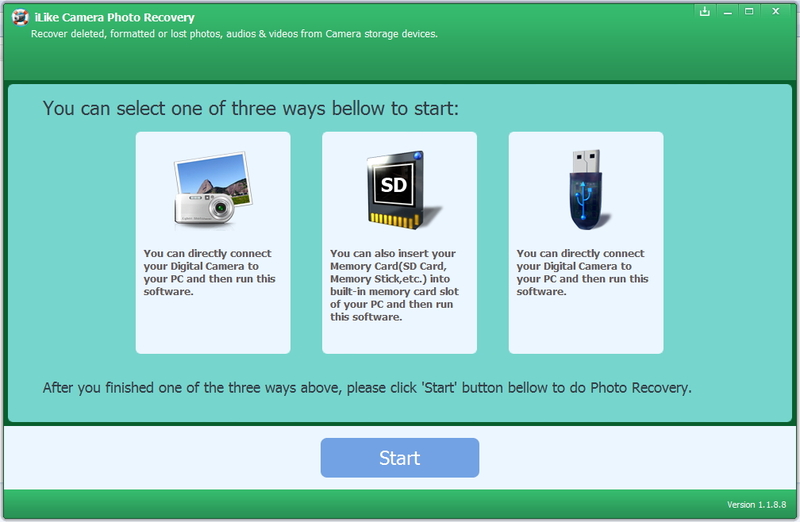 Recover deleted or lost photos, pictures, images, videos. Support all comapct digital camera DSC and DSLR cameras and HD video camcorders. Preview images before photo recovery. Why iLike Camera Photo Recovery? Digital photography produces nice photos, more and more people like it. However, any photographer may experience this: accidentally deleted pictures from digital camera, or hit reformat button by mistake and formatted digtal camera memory card, hence lost all photos. So an often asked question is that am I able to recover deleted or formatted photos from digital camera? Yes, it is possible to recover deleted formatted pictures from digital camera. iLike Camera Photo Recovery can recover lost or deleted data from digital camera memory card (secure digital card SD card, SDHC, SDXC, Compact Flash CF card, multimedia card MMC, MicroSD card, xD card, MicroSDHC card, MicroSDXC card, SD mini) or memory stick, and recover lost deleted or formatted photos, videos from various brands of digital camera/camcorder. iLike Camera Photo Recovery can recover lost deleted formatted corrupted pictures from almost all comapct digital camera DSC and DSLR cameras and HD video camcorders including Nikon Coolpix, Canon Powershot, EOS, IXUS, Rebel cameras, Sony Cybershot, Fujifilm Finepix, Olympus, Kodak, Casio, Panasonic, Samsung, Pentax, Fuji, Konica-Minolta, HP, Agfa, NEC, Imation, Sanyo, Epson, IBM, Goldstar, LG, SHARP, Lexar, Mitsubishi, Kyocera, JVC, Leica, Phillips, Toshiba, SanDisk, Chinon, Ricoh, Hitachi, Kinon, Verbatim, Vivitar, Yashica, Argus, Lumix, Polaroid, Sigma digital cameras.